The best way to contact other people on OfferUp is through the messaging system. Use it to exchange info about items, answer queries, make offers, and arrange meetings to make sales. 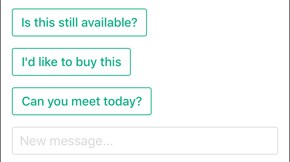 Tap one of the suggested messages to immediately send a question, or write your own. The seller will get a message with your offer. Read and reply to any messages in the list. If you want to find a message you’ve already sent and add a comment, see Find messages.